October is Domestic Violence Awareness Month. This issue affects countless New Yorkers and is now the leading cause of homelessness among families – surpassing eviction in Fiscal Year 2017. Domestic violence can take many forms, and it involves behavior that is used to establish power and control over another person. This is often done through fear and intimidation over a period of time, using threats, and verbal, emotional, or physical abuse. Domestic violence can happen to anyone, and everyone deserves to feel safe and respected. If you are in a relationship with an abusive partner and you fear for your safety, you can seek help by calling Safe Horizon’s Domestic Violence Hotline at 1-800-621-HOPE (4673). Help is available 24 hours a day, 7 days a week. However, if you are in immediate danger, then you should call 911 right away. Clients can also seek support with getting connected to domestic violence services by coming to the Coalition’s Crisis Intervention Program. 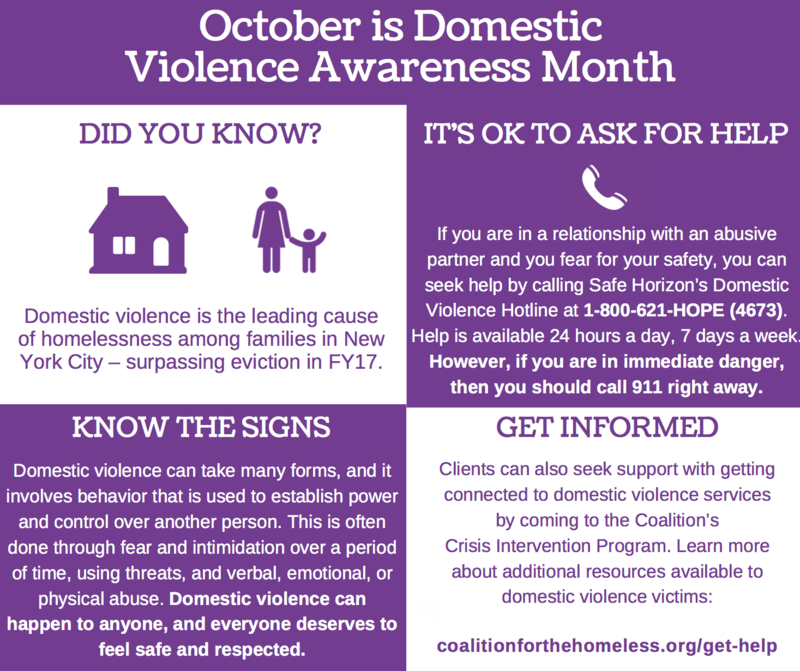 Please click here to learn more about additional resources available to victims of domestic violence. For a mayor prone to making bold promises, Bill de Blasio is taking a different tact on homelessness. “I today cannot see an end. I can see improvement and constant progress if we all do things right,” de Blasio said on February 28, 2017. The city’s goal is not to cut the homeless population in half or even shrink it by 25 percent. De Blasio says he is simply hoping to reduce the shelter population by 2,500 people over the next five years. The citywide housing affordability crisis has pushed record numbers of New Yorkers into the shelter system. The experience of homelessness is especially traumatic for the 33,460 school-aged children who spent at least some time in a DHS shelter in fiscal year 2017. During the 2016-17 school year, a record 111,562 New York City public and charter school students were homeless at some point, including those living in shelters, doubled-up with family or friends, or unsheltered. These students often struggle to keep up with their stably housed peers in class while grappling with the stresses and instability of homelessness – from navigating a difficult intake and eligibility process with their families, to being placed in a shelter far from their school and friends, to trying to do homework in a shelter that offers little privacy or quiet. One of the most traumatic and daunting experiences for homeless children and families is the application process at PATH – an ordeal that creates stress, frustration, and uncertainty at a time when the family is at its most vulnerable. Disturbingly, on Mayor de Blasio’s watch the eligibility rate for families applying for shelter reached a new low this past July: Just 38 percent of families with children applying for shelter were found eligible. Moreover, 43 percent of these families had to submit more than one application before ultimately being found eligible. It is not uncommon for children to miss a significant amount of school during the application process, which lasts 10 days at minimum – but can go on much longer for families forced to submit multiple applications. Expand after-school programming for students in shelters. The best solution to helping homeless students in temporary housing maintain engagement in school is to transition families to permanent housing as quickly as possible. We therefore urge the City to immediately increase access to permanent affordable housing for homeless families. Specifically, the City must double the number of homeless families placed in NYCHA apartments from 1,500 per year to at least 3,000 per year. Only through the provision of sufficient permanent, affordable housing resources can we begin to reduce the number of homeless children and families in New York City.